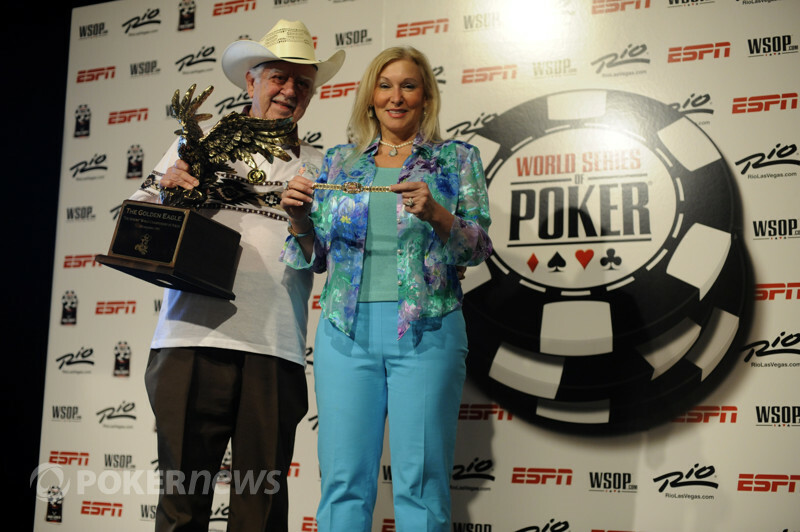 Allyn Jaffrey Shulman Wins Seniors No-Limit Hold'em Championship ($603,713)! 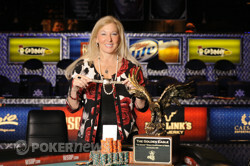 Allyn Jaffrey Shulman has done it, winning Event 29: $1,000 Seniors No-Limit Hold'em Championship for over $600,000 and her first-ever World Series of Poker gold bracelet. 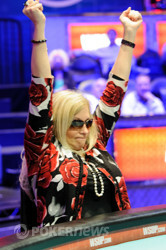 She bested a record-setting field of 4,128 players to claim the title and will forever be remember in the poker history books. Coming into the extended Day 4, Shulman was dead last in chips. She battled hard, though, and found some timely double ups to keep her in the game. 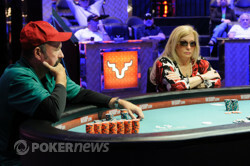 Even when she got down to heads-up play against Dennis Phillips, there was a point when Shulman was down about five-to-one in chips. She kept fighting and also got a little lucky with a runner-runner straight to get the momentum back on her side, but who said a little luck wasn't a part of poker? Upon winning, Shulman congratulated everyone, especially Phillips. She mentioned she knew he was a better player than her, but in the end she made it work. For his runner-up finish, Phillips earned over $370,000. Congratulations to the newest bracelet winner of 2012, Allyn Jaffrey Shulman, but that doesn't mean things end here. PokerNews has plenty more WSOP coverage going on, so stay tuned to our Live Reporting pages for all of the updates. The two players were quickly all in. Dennis Phillips held the and was dominated by the for Allyn Jaffrey Shulman. The flop came down and Shulman took a big lead now with her pair of tens. The turn was the and river . The chips were so close that a final count of both stacks had to be done. At the official count, Shulman had the most chips and that officially ended things with Phillips in second place. For his runner-up finish, Phillips earned $372,895 while the newest gold bracelet winner was crowned. Allyn Jaffrey Shulman moved all in and Dennis Phillips made the call. He held the and Shulman the . The flop came down and the queens stayed in front for Phillips. The turn was the , which left Shulman needing a king or a seven on the river to stay alive. The river nailed the on the board and Shulman had spiked her straight to double up. On the button, Allyn Jaffrey Shulman raised to 620,000. Dennis Phillips reraised all in from the big blind for 4.98 million and Shulman quickly called. Shulman held the and Phillips' . The two stood together in the middle of the table to watch the action with an arm around each other. The flop, turn and river ran out and Phillips doubled up. They gave a hug and then went back to their seats, with Phillips now in a commanding chip position. Allyn Jaffrey Shulman raised to 620,000 on the button and Dennis Phillips called from the big blind to see the flop come down . Phillips moved all in and Shulman quickly called. The turn was the and river the , forcing the two players to chop up the pot. Allyn Jaffrey Shulman had the button to start this hand and raised to 620,000. 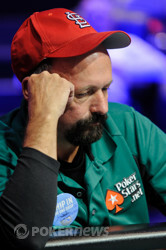 Dennis Phillips shoved, returning the favor from the last hand, and Shulman folded. After Dennis Phillips raised to 525,000 from the button, Allyn Jaffrey Shulman reraised all in from the big blind and won the pot.